Health Mate App Has Many Problems Since Nokia Took Over From Withings | Christoph Bartneck, Ph.D.
Reading all these negative comments makes me scratch my head. I have Activite Steel and Body Cardio scales and they have continued to work exactly as before through the change from Withings to Nokia. I think some people may need to look in the mirror when considering where the problems could be. Jonathan, you may not have had issues but others may use features that you do not use. My BP Monitor had to be re-synced every use to get it to work. My Cardio does not have the option to share with another account in settings. These are known issues. My Steel HR would need to be re-synced every couple weeks. Today it just stopped syncing. Finally gave up and bought a fitbit. I’ll miss the stylish watch and the month of battery time, but fighting with a watch to get it to sync just got too annoying. Since Nokia took over healthcare it’s not been awarding badges. I know it trivial but I did look forward to getting them. It doesn’t seem to be counting my steps as well either. My saved notes just disappears. Actually, I’m relieved to see all these comments. I thought that maybe I was looking at things in the wrong way. Ever since Nokia took over it seemed to me that they have attempted to fix a product that was not in need of fixing – and sometimes they have even programmed incorrect math into their graphs. I’ve sent a number of e-mails to the customer support people expressing my dismay only to receive saccharin responses – what I call non-response responses. The best thing to do would be to reinstall the original functionality of the Withings website and app. I agree with Barbara – I now have less incentive to use the products because the user interface has been greatly degraded. Why Nokia repairs something that worked perfectly? And in September 2017 it still does not work. The scale was bought together with the application. The App is the integral part of the scale. What the Consumer Services will say? What about the guarantee? I used the Withings app primarily for tracking my weight and had several years of valuable weight data all of which has up and disappeared with this change of apps. While I can’t see it in the new Nokia app right now, I’m hoping like heck they still have all of my weight data and that it will reappear in their new app one of these days! Where is my weight history now? I used the Withings app primarily to track my weight. And now Nokia app does not show them anymore. Nokia, please!! You cannot erase my data in a day like this!!!! Please make my data accessible again. Los gráficos son un desastre de diseño pero lo peor de todo es que ya no hay una correcta funcionalidad y una garantía científicamente probada. No acepto ni la presentación ni los datos ni la forma de funcionamiento . Si me permiten una opinión : esto no es digno de Nokia. The new Health Mate of Nokia is not sending sleep data to my iPhone. It is very frustrating!! Sleep data does not update to android phone from steel HR. I had no problems at all until 1st of August and everything stopped. The scales are clearly connected to my phone, bluetooth and Wi-Fi bit no matter how many times I reconnect, it’s not syncing. There’s no prompt to sync from within the app that I can find but it sttangely, it seems to have all started when I deleted my lifesum app, after the membership expired. I might reinstall and see if it connects everything again. No idea why it should only work with that and not it’s own bloody app. Yes, Nokia has really made a mess of this. The New GUI is cluttered with the same date repeated several times, instead of providing clear and simple graphs. On top of this, the data in the iPhone is not always transmitted to the web page. Previously I always got very quick and helpful responses from Withings, nowadays it can take several days before Nokia answer. The brand name Withings used to have a very good reputation, but now it seems like Nokia is trying to kill it. I assume that many loyal customers will leave this product range if we do not see any quick improvement! I have the original Whithings wired blood pressure monitor. Never had a problem until now. Everything works like it’s supposed to up until I log out of the app (v 3.0.6). The next time I log into the app, the data my blood pressure monitor last entered is completely missing, including the comments I made for that day. This is so frustrating. i am having issues with step counter. it uppgrated for two days ago and refuse to uppgrade till now what ever i do. Withings Activite still under guarantee! App not working. Disgusted with Nokia – until now thought Nokia was a decent business! Spent hours on this mess! The dashboard is awful now. I get what is the experience of mobile app on a full sized laptop. I have a Withings Steer HR. The NOKIA version is still not available. Last week I walked more or less 99.9 kilometers. I participated in an 80 km event and did some walking before and after the event. 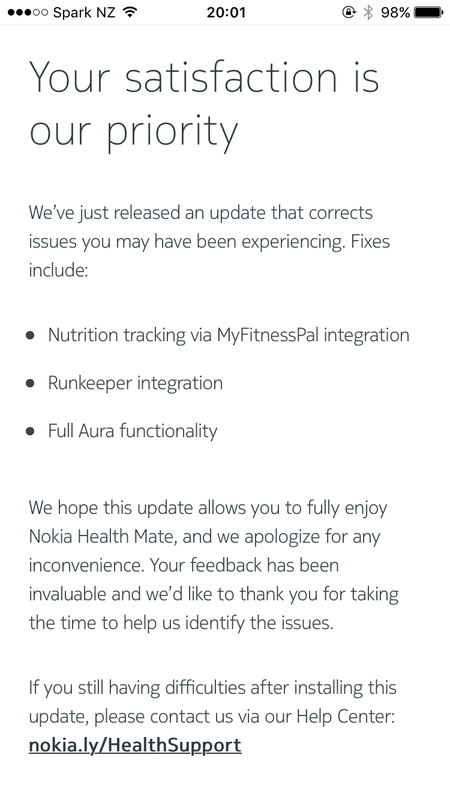 Nokia updated the Health Mate App and guess what? I now suddenly walked only 74.7 kilometers. How encouraging. I am already waiting since june 2017 for a new watch, because mine has condense in it frequently, even though I never used it under the shower or during swimming. Nokia has failed when it concerns mobile phones. I am afraid that they are going to fail again with these so called health products. I had very similar problems. Some activities not recorded, others recorded twice. Awful, unreadable design. Functionality removed for no reason. Inept support. I have now given up on my Active watch and it will go on eBay. Such a shame. I was horrified when I saw Nokia bought Withings because their cell phones were always complete trash. However I hoped for the best only to discover that none of my data now shows up in my timeline or anywhere else that I can see. It I.s some consolation to see that others are having similar issues. So many folks just want motivation to stay healthy. Sad Nokia has ruined a stellar product! I’ve been having massive issues with syncing withings steel hr since Nokia took over – have tried factory resets, app reinstalls, it’ll work for a few days then watch can’t be found by the app – even though my phone detects it. Ridiculous. This was the second withings watch I bought, and it’s the last one too. Now this evening, I have needed urgently to check the pressure and my system I paid 99.95€ the 28 oct 2016 is no more working…. This system has worked in the past, and it has to continue like before. If something occur to my wife, I will bring Nokia before Justice. I suggest -strongly- that either Nokia fix this problem, or Nokia put back on the app store the original withings app & associated process. I have the tracker device and it appears to work for activities. But the sync data on the app does not reflect that activity. I’ve been in touch with Nokia but it’s Circular & no fix. So, I’ve bought a Garmin. Very disappointed since the Withings sale. My scales no longer sync with the new app. No notifications of the change to Nokia. The activity tracker and step count on my Withings Activite Pop has been rubbish since Nokia took over and the app is completely crap. It records my swimming twice (if it manages to detect it at all), records my runs as “fitness”, doesn’t record all my steps..in essence I now have a watch and not much else. Nokia you should be ashamed of trashing such a great product! Am going to buy a fitbit. I thought maybe I was doing something wrong at first but that was not it. I feel like these “hundred dollar scales” was a waste of money now. The app or dashboard was basically the whole reason I bought the scales. If it will not track or keep my weight history it is of no use to me. I can weigh myself on a $20 scale just as well at this point. As Christmas gift I bought for my child a Withings pop. I am getting crazy to connect the app (iPhone 6 SE) to the swatch. Someone can advise me? No ways to connect the iPhone with the device despite on the box is clearly written for IOS go to the AppStore! Did you find a way to access the historical data that has not synced with the nokia health app? You can sync your data with Apple Health and maybe take it from there? My new Nokia steel watch no longer syncs after an app update – tried all support advice and more. Very disappointed. History of temperature is missing since Nokia rebrand Withings…?! The battery on my Withings HR steel only lasts about 5 days since Nokia took over. I am extremely disappointed as this is not the product I bought. I am staggered that the withings products have gone backwards since Nokia … the support is atrocious! It’s solely a list to tick processed, no reaction, just follow these steps; they do NOT work. And no follow up. Apologies that we can’t fix? No way! Let’s refund? No way. How can it be so wrong? How can Nokia sit by and not take corrective action? It’ll fail because the likes of me are saying to all my friends “do not buy”. Very sad to see this happen after a long relationship with many products. As for the latest farce where they are removing functionality from the scales for customers who have already bought the product. I am now looking to ditch all the Nokia/Withings products I have and replace them with alternatives. Same here.. Having issues with Steel HR. Can not do factory reset due to the push button failure. Also the thing stopped pairing with both android and iphone. I am wondering is complete discharge may help.. Very dissapointed. Nice looking watch but now generally useless. Oh, and the condensate… It appears every time i go outside when it is below zero celcium. I cannot pair my scale and lost all history. Is Nokia going to get the message to bring the old app back. Wouldn’t that be a simple solution. There was nothing wrong with the original app…WHY make a totally new one??? I actually NEED the old data for health records reasons. We bought two systems, 2 watches, 2 scales and 2 bp cuffs. At times the Bp cuff will just dissapear and on my Grandmothers it will not carryover her muscle or fat mass. I called support and was told they never heard of this problem. I been hanging on for a month and today I just googled and found out that I am not the only one that is having problems. We spent $1300 dollars and now I feel that Nokia was just stringing me along. anyone have the same problem. I stopped using my scale awhile ago when my scale kept switching between units randomly. One issue fixed, 1000 more to go to get back to where this app used to be. At least my withings scale still remembers who I am and tracks minor progress. I also seem to have some historical weight data showing up, but not body fat %. I tried their “better body” feature. Still waiting to see if the app syncs with my scale to give them that data. What a joke. Good lord all this makes my query slight. I was given the Aura. My issue is that suddenly it no longer charges my Iphones. This may be down to Apple. I no longer trust them and am looking for an alternative. They seem to set their charging requirements so that charging devices other than theirs will not work. For the Aura which I have. I have never studied it to get all the data. I do lots of sport and have never bothered to use it to measure anything. I get a full health check twice a year which i find OK. But it is interesting how so many intelligent and dedicated people here are losing faith or have lost faith in Nokia. had they done a great job then all these people would have been ambassadors fir them. Silly. This article and the comments made me get another tracker. Can’t believe Nokia still hasn’t fixed many of the issues people have and isn’t even offering the old app which was apparently working very well. I’m Nokia will never read my comment but they’ve just lost a potential customer. I have the Body Cardio, the BP monitor, two watches, the Thermo, and the Sleep Pad. Like the man says, everything used to work flawlessly under Withings. I recently acquired an Apple Watch and now, every few days, it just drops a days worth of steps (just does not sync them from Apple Health) from the weekly total. My complaint will get escalated to three or four different tech reps and then eventually I get a, “sorry, we are working on it.” Annoying to say the least.